LONDON, ONT. 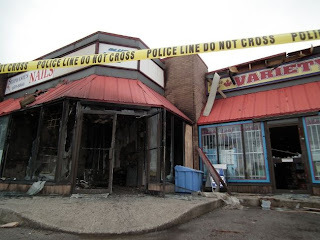 - Street gangs with outside muscle, targeting the Hells Angels, have sparked the outburst of violence that's left five adult businesses in flames and two people shot, police said Wednesday. Late Wednesday, three of the men police arrested — two from London, one from Brampton, Ont. — appeared in court via video to answer charges related to the shooting. All three men are black, giving credence to the police theory that biker gangs — which don't usually allow black members — aren't responsible for the recent violence. Hold the door. Greg Wooley was Black and the Hells Angels certainly used him. They made him a member of a puppet club in Quebec called the Rockers and put him in charge of his own gang called the Syndicate. That way the White Supremacists were able to supply all the Crips in Montreal with cocaine. Buyer Beware. Correct. He was a member of a puppet club called the Rockers. However, through his group the Syndicate the Hells Angels were able to supply all the Crips in Montreal. The Hells Angels will use or contract anyone to do their dirty work for them. Sources are now saying that the street gang is the FU Crew backed by the Outlaws. Not rocket science in my mind. There was also a second shooting that the police hadn't originally divulged. The target was friends of both the Outlaws and the FU Crew. They've also now identified the fourth suspect in the shooting of Diamond Ialenti. But they're no longer naming the suspects "out of concern for their personal safety". A little late for that. I'm curious as to why none of the four are charged with the shooting yet - only with possession of the firearms. Intersting indeed. Thanks for the update. Looks like the Hells Angles' drug war is expanding to Ontario now as well. Great. That's all we need. The worse thing Ontario did was cripple them and allow them to go into hiding. It's easier to deal with when you know where they are. I don't think you give The Asian hindu and black gangs enough credit. Not to many whites working The docks. Just saying. I'm just saying the black gangs in Montreal were supplied by and ultimately worked for the Hells Angels. Tell that to Greg Woolley. He works for the Hells Angels. He's not Jamaican but he is supplying a lot of people in Montreal with cocaine. big talking coconut picker,youll all get rounded up and dealt wiff.hells angels dont allow blacks.they arent trustworthy. huge jarse: That's the epitome of white trash. The HAs aren't trustworthy. Just ask Ernie Ozolins, Britney Irving and a whole list of others they have screwed over for the almighty dollar.